Matlock, situated on the Great Dividing Range, 110 km north-east of Melbourne, was the site of a goldfield and of a supply town for other goldfields in the nineteenth century. 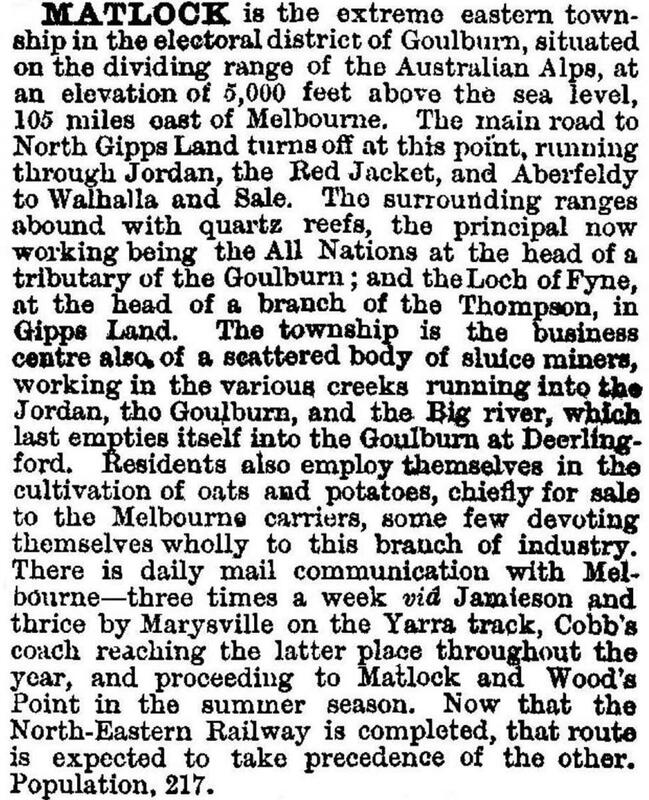 It was the highest township in Victoria. A government school operated from 1871 until 1895. The school was reopened between 1898 and 1911. By the 1920s only a handful of residents remained in Matlock, the two notables being the proprietor of the hotel, who stayed there after it was delicensed, and the postmaster. The Black Friday bushfires, 1939, destroyed the few remaining buildings on the summit, along with a timber mill. A sawmill operated between the late 1950s and 1975, and when it closed all but two cottages were removed. No further census figures were published. The place is marked by a snow shelter at the roadside picnic area, the remnant cemetery and Matlock Hill off the road to Walhalla.